When the Bush era Vision for Space Exploration was released NASA said "it was going back to the future" for its next generation of space vehicles, they didn’t realize how right they were. They went all the back to 1970. Back to a time when Richard Nixon decided manned spaceflight wasn't a priority anymore. In 1970, Nixon gave a speech on the future of the space program eerily similar to the latest Obama direction for NASA. Outside of the speech, Nixon had already established a timetable to end Apollo and use the last of the hardware for Skylab and the Apollo-Soyuz Test Project. Only because NASA persisted did manned spaceflight survive. NASA had managed to sell Nixon on the idea that deploying satellites would be cheaper if they were launched on a manned reusable spacecraft than using unmanned expendable rockets. It was a close call for the manned space program. Nixon was drunk with his power. He had forced NASA to rethink how they did space, and forced them to do at a cost much less than Apollo. He touted it as a bold new era for space. We would do even bigger things with a much smaller budget. Well, at least that was the thinking. What Nixon, along with his successors in the Oval Office, never learned is that space is incredibly complicated. Presidents aren’t engineers, aren’t strategists, they’re aggregators of information. We hire them to make decisions based on their ability to come to a reasonable assessment. For a large part of our history, they have failed us. Space is an area where if you do it wrong, lives are lost. You plan wrong and costs go up. We know how the Nixon strategy played out. It wasn't cheaper to fly the Shuttle, and it diverted scarce funds for decades that could have gone into the next phase of deep space exploration. NASA has never recovered. Now, another President wants to make another bold course change; one that will be better, cheaper, and take us on new adventures. Where have I heard this before? Did you realize that since Apollo 17 left the moon in December of 1972, and counting the time until ARES-1 was supposed to fly, that NASA would be grounded 11 years during that time? Twenty-five percent of the time NASA stayed here on Earth. That’s what you call a bad strategy. I like Charlie Bolden, the NASA Administrator, but if he seriously believes we'll get to the moon quicker under this direction, than Barack Obama is not just a politician, he’s a magician. It can't be done. At an absolute minimum, we need the ARES V heavy lift vehicle. You still need to put components of significant weight into orbit even if you can get crews there commercially using SpaceX. You'll need transit vehicles, fuel, and a lander. If SpaceX is going to do all that, then great, but it certainly won't be in the lifetime of anyone reading this. Sending NASA off to explore this hodgepodge of new technologies is something they should have been doing all along, but not as a substitute for manned space. What makes Obama think this assortment of research won’t be more expensive than he’s given NASA money for? If you kill Constellation, it's not coming back. In 2020, when we bailout of the ISS, we'll be having this "what to do next" discussion all over again. The anti-NASA crowd always cites "how it was over budget anyway". It wasn't "over budget", it was "underfunded". NASA spends more than it plans because it gets less than it needs. NASA had tried to do the most complicated thing on or off the planet on a shoestring. It won’t work. It’s been that way for forty years. NASA has been given a fixed budget and then has to make the rocket fit the budget. It’s a disastrous formula. We never learn. That Bolden equates the loss of Constellation to a “death in the family” is evidence NASA wasn’t in agreement. What have we learned from Nixon and Obama? Nixon didn’t care about space. He was out to be the President who would be the world’s statesman. His mission, have détente with the Soviets and open China to America. Sending people into space and to the moon was Kennedy’s dream. Nixon was out of touch with what space could do for America. The program and the country would pay the price – in human lives, financially, and technologically. As for Obama, what his passion for space is we don’t know. He’s been on both sides - for it and against it. What we do know is he wants to be branded as different and works hard at it. When it calls for conventional, he’ll do the unconventional. Do I think he knows it all? That he’s infallible. Hardly. Let’s look at an example. He decides the Air Force doesn't need the F-22 Raptors - despite the fact that the current mainstay, the F-15, is a 70’s era fighter. "The Air Force is out of touch with modern warfare – they’re fighting last century's war” he says, “We need to build more UAVs". On the surface, that sounds reasonable. We’re fighting two wars and neither requires air-to-air combat. However, China announces their 5th generation fighter, the F-22 equivalent - and guess what? They're going to build at least 500 of the fighters, and likely more - enough to overwhelm whatever concentration of F-22s we could deploy in a conflict (less than 200 will be produced out of an original plan of 800). It just happens to be that the Chinese are about 5 years ahead of when we thought they’d be able to build them. It sounds like a strategy mistake. It’s the right tactic for one situation and wrong for another. In the case of UAVs versus F-22s, we need them both. There’s no choice to be made. Our continued missteps have emboldened China. Every weakness we exhibit makes them that much more confident and stronger. Recently we announced we’re going to sell arms to Taiwan. The move antagonized China. That’s fine, but China is expecting a clash with the U.S. over Taiwan. They are preparing for it. Obama, Clinton and Gates need to do their homework. China is out to dominate space and to take the U.S. advantage away in such a battle. We have taught China well. They’ve watched how we've conducted military operations and they know the importance of space. Their civilian program and military space program are tightly connected. Did you know that in 2006 China blinded a U.S. satellite with a ground based laser? How about when China did that well publicized anti-satellite test – did you know if was from a mobile launcher? The test showed a mastery of multiple space skills and a bold strategy that could create a “Pearl Harbor” equivalent in space. Finally, in January, 2010, they successfully conducted an anti-ballistic missile test, their version of Star Wars. One other point of interest – in the early 50’s China tried to talk the Soviets into attacking the United States. They saw it as inevitable and combined with the Soviets they figured sooner was better than later. Hard to believe, but the Soviets showed restraint. They knew it would be a nuclear exchange that would devastate their country while leaving China largely intact. All of this talk about we’re not competing with China, we are, and especially in space technology. There’s one other thing China has learned from the U.S. – how not to run a space program. China recently stated that they are not in a space race. Their goal, build a sustainable, long term space program. The U.S. version, change every few years as Presidents, who closest qualifications of directing a space program are that they may have watched an episode of two of Star Trek, discard what we’ve built and start all over. This is not the way to advance human spaceflight. Alright, so what’s the point? The point is that mastery of space is important. Our military and civilian programs feed each other. Cutting half of the program out will hurt us short term and will cripple us long term. China is no longer the backwards country we all think they are. They’re moving fast and have a long standing grudge against the west for previous occupations, they hold the key to our financial stability, and they’re buying time for the day that they will stand toe-to-toe with the United States on the world stage. That day is coming fast. In 20 or 30 years, when China is leveraging the resources of space to their benefit, we’ll look back at this time in history and see it as the moment we gave up. The moment our President decided to throw the towel in the ring and concede defeat. We bailed out GM, AIG, Citibank, and a host of banks and industries that we deemed vital to America, but we let the dream of space fail. Every nation in the world can build cars, only a few can go into space. That Barack Obama decided that being a technological leader in space wasn’t worth saving speaks volumes for our leadership in this country. Obama’s decision is much like Nixon’s. He’s trying to be different to be different. Nixon was wrong, Obama’s wrong. It likely won’t be reversed and NASA will wither. For those followers of human spaceflight, all is not lost. There’s always Russia, China, India, and Japan – and more countries to follow who see leading in space as a technology enabler and not just an expense. Sorry Mike, but I disagree with this one. I know you wanted to see the "Vision" get us back to the moon, so did I, but it just wasn't going to happen with Ares for reasons the Augustine Commission clearly laid out. The HL:V will happen sooner under the new directives, SpaceX is stepping up with the Falcon9 launches this year, and the things NASA will be working on will get us to Mars sooner than Bush's plan would have gotten s to the moon. Take heart, good man, and don't believe what FOX News tells you about the NASA budget! I agree with you. This new program is actually a stealth Mars First program. Bolden has talked about developing technology that can get us places faster. Since it only takes a few days to get to the Moon, he must be clearly referring to Mars. That's why I believe that this new policy is really a stealth Mars First policy. Abandoning the Moon is a huge mistake both strategically and economically. 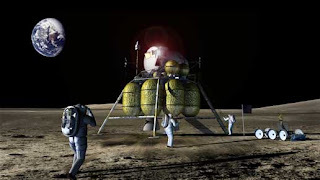 We could end up deficit spending attempting to send men to Mars while the Chinese are making billions charging Americans on other space tourist to visit their lunar bases! I don't know that our opinions are too far apart. I would be happy to concede LEO to SpaceX. They're innovative, dynamic, and have a shot at making it work. They have a lot more testing, have got to get a man-rated stamp from NASA, but they'll get there. As for the rest, my biggest peeve is the lack of vision. There's no place to aim for, no target. The tasks NASA will work on are all things that can easily be cut. If it takes too long, costs too much, it's susceptible. Without a mission, you won't get the best and brightest, and you won't engage the public. An HLV sooner? Well, ARES V was already pushing the tail end of the decade and that was with a solid design and tested components. I hope you're right. I really do. I'll be excited to see the Dragon fly, but much more excited when NASA gets the funding and the direction it needs. I'm not as hung up on the going to Moon or Mars now thing. I'm more interested in building a sustainable space program. I think those objectives are outcomes of a solid program. That looks to be a long ways off. It's been interesting reading the comments on various news sites. One thing for sure. It's a divisive issue. There are strong opinions on both sides. Thanks for the return comment. You're a good man and I value both your writing and your critical thinking. I agree with much of your reply, and think that it's a sad state of affairs when one party is willing to bash a commander in chief's directives, no matter which direction they decide to go. I'd have been happy with the concept of the Ares V, and under the budget laid out, there's no reason why the work done and money spent won't give us that exact spacecraft in 3 years. HLV is all about using the shuttle fuel tank/SRB combo with a payload/main engine that doesn't have to be able to fly back for a landing, isn't it? We've got the technology, and the plans are there. The new budget supposedly gets to that part of the project a few years sooner than the VSE did. In our current political/financial climate, there's no way the CIC could do anything that looked like "more spending" on our manned space program (although the annual budget was increased). Hell, he's getting handed his lunch on EVERY proposal, nominee, and directive that comes out of the White House as it is, even if it's something that the minority party has dreamed about for years! I think he did right via the Augustine Commission, and if he can manage to get reelected in 3 years, and if we don't see another total meltdown of some sort (that's the BIG if), we will be much better positioned to take the critically important step of getting boots on the ground, on Mars. Until then, the science and robotics IS fully funded. More probes like Cassini mean a wealth of knowledge for mankind. When I got the news about the cancellation of Constellation program I thought "oh no. Again they're doing this" and you're right. It's a big mistake. China will take the lead, now Russia wants to charge more America for space transport to the ISS. America cuts from one side, but will have to spend on other things. America spends a LOT in the army. OK, I understand the security concern and the leading role to protect themselves from any possible conflict. But can't any US President realize the importance of space exploration and manned missions?